Washington (CNN) - National Rifle Association President David Keene signaled Thursday that Senate Majority Leader Harry Reid, a Democrat who has enjoyed the powerful gun lobby's support in the past, could prove pivotal in the heated debate over gun control. Reid has found himself in a delicate position as he tries to navigate the desires of many members of his pro-gun rights Nevada constituency and the White House and members of his caucus' intensified push over gun control. As Senate majority leader, Reid has great influence to speed or slow the consideration of legislation on Capitol Hill. "He's under incredible pressure right now because he's got, as any member of Congress or senator does, he's got his own beliefs. He's got the views and the demands of his constituents on the one hand and the pressure he faces from party leaders and his president on the other," Keene told journalists at a Christian Science Monitor sponsored breakfast Thursday. "So where Harry Reid ends up in this debate is anybody's guess and I think that's one of the guessing games that's going on around Washington now." Reid has twice opposed the assault weapons ban back in 1992 and 2004, has a B rating by the NRA for his pro-gun rights voting record and since 2008 has received just shy of $8,450 from several gun lobbies according to an analysis of campaign contributions from the Center for Responsive Politics. The NRA has also previously supported Reid in his primary races, but Keene said he has not spoken personally with Reid about the recent back and forth over gun control legislation. 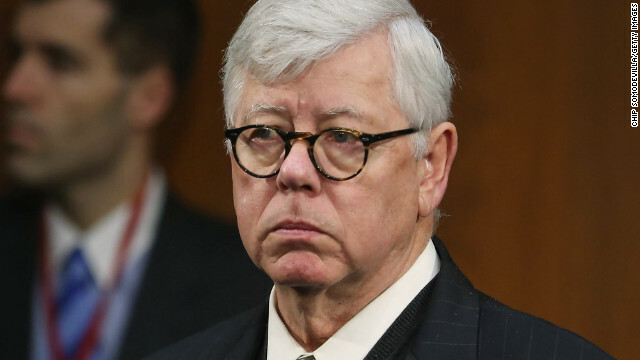 The nation's top Democrat in Congress has faced scrutiny in recent weeks for his close ties with the National Rifle Association. Reid slipped a provision into the 2010 national health care law that restricts the government from collecting data on gun ownership, as reported by CNN's National Political Correspondent Jim Acosta. On the other side of the debate, fellow Democrats including a group led by California's Dianne Feinstein, proposing a ban on semi-automatic rifles and ammunition magazines exceeding 10 rounds, argue that restricting access to such firepower and expanding background checks to as many gun sales as possible will help. Reid has not said how he would vote on that measure but would work to ensure a variety of gun control legislation is brought to the floor of the full Senate for consideration. "…We're going to have votes on all kinds of issues dealing with guns and I think everyone would be well-advised to read the legislation before they determine how they're going to vote for it," Reid told reporters this week. Keene's comments follow Wednesday's congressional hearing in which National Rifle Association Executive Vice President Wayne LaPierre blamed the government for failing to enforce existing gun laws and said new restrictions, including background checks, won't stop criminals from using weapons in violent crime. "Law-abiding gun owners will not accept blame for the acts of violent or deranged criminals, nor do we believe that government should dictate what we can lawfully own and use to protect our families," Pierre said. The first congressional hearing since last month's Newtown, Connecticut school massacre hearing was also marked by the appearance of former U.S. Rep. Gabrielle Giffords who was shot in the head by a gunman at a political event two years ago. "Too many children are dying. Too many children. We must do something," Giffords said in a rare public appearance Wednesday, reading a statement that acknowledged her injuries made it difficult to speak. "It will be hard, but the time is now," she told the packed hearing held by the Senate Judiciary Committee. Keene said his group has reason to believe otherwise. "I think that our opponents' hope (has changed)," Keene said. "They hope that they can use emotion to achieve an anti-firearms agenda that they haven't been able to achieve in the past. But my suspicion ... (is that) people are smarter than politicians and that common sense ultimately prevails. I am convinced that as these things are discussed, that we're going to come out about where we have come out in the past." - CNN's Jim Acosta, Dana Bash and Tom Cohen contributed to this report. Pressure ? How about the pressure of trying to speak before a National Television Audience after having 1/2 of your brain blown out by a nut with a 30 shot clip in his pistol? If enough people in Congress can show the guts to SOMETHING it would be a good testament to the many victims who've been killed or maimed since George W. allowed the ban on Assault Weapons & high capacity clips expired in 2004. I hate to see such an important issue decided by political allegiences. It should be about what's best for society. See http://rationaexaminer.com for a discussion of the issues. I'm sure the gun huggers think this is a problem for Harry Reid: I don't think so. He last won-re-election against a Tea -Party, gun hugging wingnut, and its highly doubtful his growing base of new support in the Hispanic community is going to be won over by the NRA perversion of the 2nd Amendment. Energy: take advantage of new technology of fracking and allow an increase of drilling on public lands... this recent boom is on private lands... federal apps are down under this administration. Allow Keystone pipeline... the state want it... let it happen. Banking/Corporate: decrease Corp taxes so that its competative on the world stage, allow a limited tax amnesty on billions of corp $ overseas... bring it over to the states to use on capital projects. These are 4 pro growth policies off the top of my head that Obama could do anytime... could you name 4 pro growth policies that this administration has done? P.S. stimulus is not a policy. A 14-year old in Atlanta was shot in school today, and a DA in TX was shot and killed in what was described as an attack on the Justice System: where are the good guys with guns, Mr. Keene? Why are these shooting happening in Red gun-hugger states? Could the number of firearms that have flooded this country have ANYTHING to do with it? Their are a lot of lobbyists on both sides the gun issue but the NRA seems to take all the heat. Notice the left never complains about their lobbyists. Keep this in mind, in 2012 Chicago had the equivalent death toll as Newtown every 19 days.To put it another way, in 2012 Chicago has a murder rate equal to almost twenty Newtown tragedies. And this is city that is Obama's hometown, has Obama's former chief of staff as mayor and has some of the strictest gun control laws in the United States.